I’ll never forget the day my fourth grade teacher, Mrs. Saunders, explained that in order to break the rules of grammar successfully, you needed to know how to follow them correctly first. This little lesson, while only meant to apply to writing, has never led me astray, especially in cooking. You can’t leave out punctuation until the reader is confident you are doing it with purpose, otherwise you look like a fool. You can’t make a cake and just eyeball the measurements until you can follow the recipe. 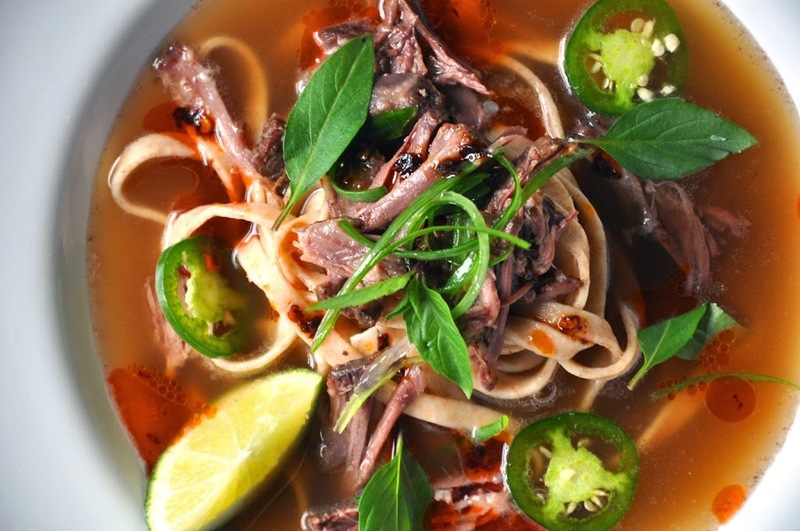 Combining pho and ramen, two of the best loved Asian noodle soups, takes skill and care man. You can’t take a twenty-cent orange packet of noodles and sprinkle on some Chinese five spice powder and a squirt of sriracha; it just doesn’t work. 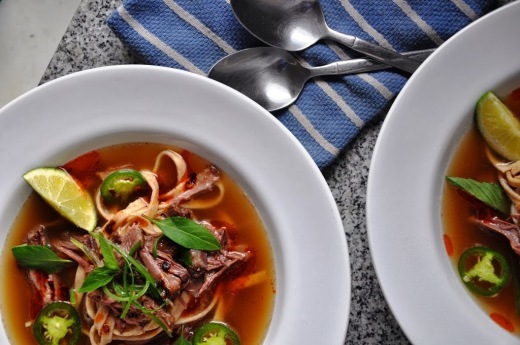 But authentic, no shortcut, oxtail pho served with homemade egg noodles? If this sounds sacrilegious to you, then I’m not sure we can be friends anymore. This sort of cross cultural, fusion has given birth to Pad Thai, arguably the best noodle dish on earth and matzo ball pozole, which is nothing short of genius. Say you took a couple pounds of meaty oxtails and seared them thoroughly, dumped in a bunch of charred onions (and I mean, charred, as set off the smoke alarm but don’t burn the house down charred), sliced ginger, along with a whole mess of spices and water and let it simmer for eight hours. You would have some damn fine pho broth. Then say, you were to make some thick, whole wheat noodles with the help of your food processor and pasta machine, designating them ‘ramen’ (however untraditional the preparation) before mounding them in a large bowl. To this you added a few chunks of the supremely tender and succulent oxtail meat, and then ladled over the heavenly spiced broth. If you did all that, it would be quite good, like the best beef noodle soup you never had from a red-and-white-labeled can. 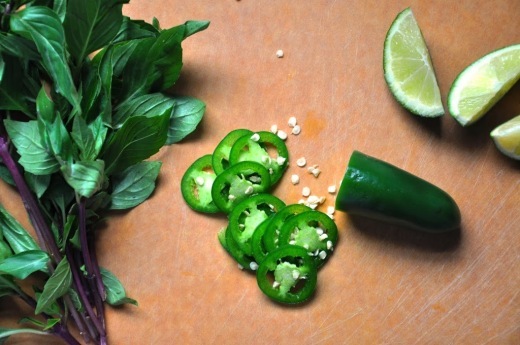 But if you were to lightly garnish the bowl with slivered green onions, Thai basil leaves, a lime wedge, sliced jalapenos, splash of soy sauce and a few drops of chili sesame oil, you would have something amazing. An oozing, soft cooked egg would not be a bad decision, although superfluous at this point. I’d like to think that I have learned to know when to follow the rules (don’t rush the broth), when to bend them (stir sriracha into the bowl or serve on the side?) and when to snap them completely in half (phramen). Mrs. Saunders, you were so right. Heat the oil in a large stock and sprinkle the oxtails liberally with salt. Sear on all sides until thoroughly browned, 10-15 minutes. Meanwhile, spread the onion out on a sheet pan and place 3 inches from the broiler. Cook until the onion is thoroughly charred on one side, about 4 minutes. 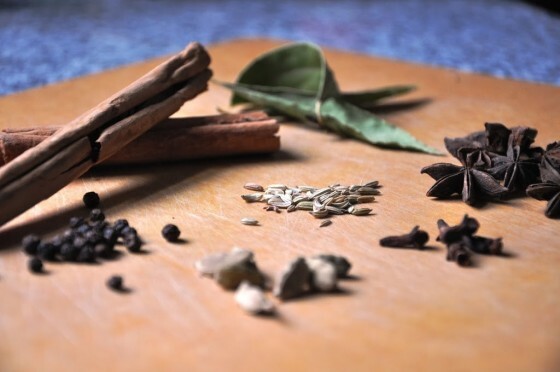 Scrape into pot with the oxtails, along with the ginger, spices and a gallon of water. Bring to a simmer, then reduce the heat to low. Cover with a slightly offset lid and simmer for 6-8 hours, until the meat is completely tender. Take out the oxtail pieces and set aside. Pour the broththrough a colander to remove the large chunks and discard. Then line a mesh strainer with a coffee filter or cheesecloth and strain the broth, discarding any remaining solids. Put the oxtails back in the broth and allow to cool to room temperature before refrigerating overnight. The next day, scoop the fat off the top of the broth and discard. 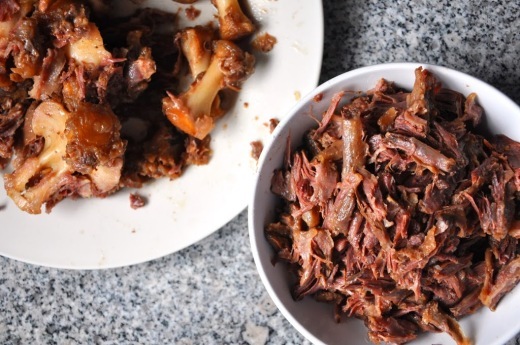 Heat the broth to liquefy it (it should be wobbly like loose Jell-O from all the natural gelatin) Take out the oxtails and shred the meat, discarding the bones and cartilage. Set the meat and broth aside (or refrigerate for up to 5 days). 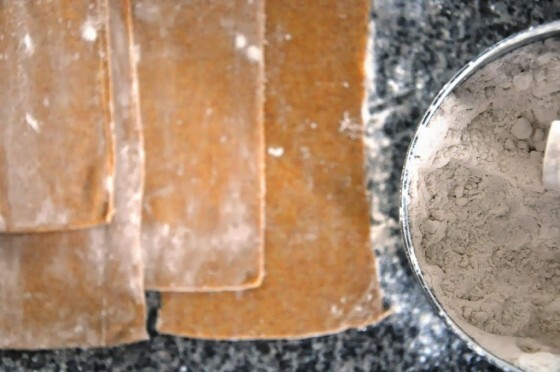 To make the noodles, combine the flours and salt in a food processor (or large bowl if making by hand). Add the eggs and pulse (or knead) until a stiff dough forms. If it’s not coming together, add a tablespoon of water and mix until combined. Form the dough into a disk, cover with plastic wrap and set aside for 30 minutes. 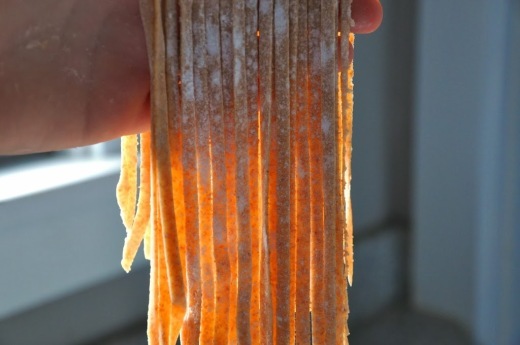 Set up a pasta machine and cut the dough into sixths. Take one piece, coat it lightly with flour and feed it through the machine on the widest setting. Fold into thirds like a letter, then feed it through the machine again. Pass it through repeatedly, reducing the setting each time until it’s a “4” or a “5”. 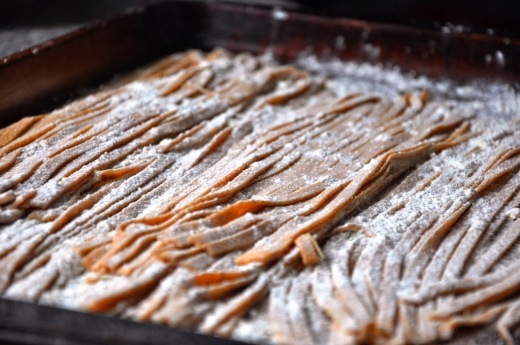 Coat the pasta sheets liberally with flour, then cut with the machine or by hand into ¼” noodles. Toss with flour again and lay out on a sheet pan, then cover with a dish towel until ready to cook (or freeze on the sheet pan, then place in plastic bags for storage up to 2 months). Bring a gallon of water to a boil. Shake off the excess flour off half the noodles and cook for 3 minutes, until al dente. Remove the noodles to a large bowl and coat lightly with oil. Repeat with the remaining noodles. 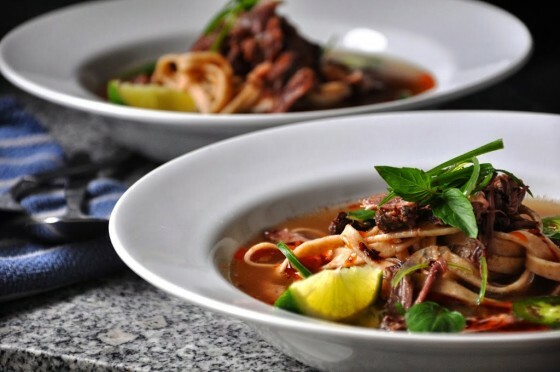 To serve, mound a serving of noodles in a shallow bowl, along with some of the shredded oxtail meat. Pour the broth over the noodles and serve, along with little bowls of garnishes and allow the diners to help themselves.